Anyone can create videos, podcast, quotes and write blogs straight from their laptop. However, not everyone can tell a story through uniquely created content to be marketed on social media platforms, which keeps you marketable at the highest level. If you master of your craft and know that you can serve the people from your brand verse selling them something for your benefit, you will see amazing results. People do not like being sold to when they work for you. However, clients love to buy things that are a solution to their problems. They buy when they know how your brand will help them. The success of your brand relies on how well people understand what you can offer them, and best serve them in their quest to achieve greatness. People do business with brands they know, like, and trust. Start working on building strong relationships with clients to remain marketable at all levels. The most reliable foundation of any brand is the collaborative “relationships” that the brand has. When you are trying to build any businesses the best way to start is to build “genuine relationships” with people, where you are not trying to sell them anything out of the gate. This way you get to develop a strong bond, and eventually over time “business” will get accomplished! One of the best ways I like to market myself is by creating videos that tell a story, and also have valuable teaching points in the video too. People want to get to know the real you, and one of the most effective ways they can do that is watching you on video. 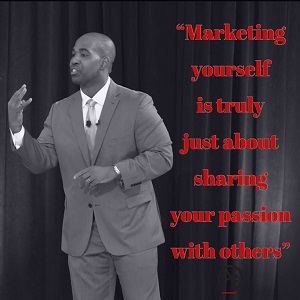 Watch your passion, your speech inflection, your mannerisms, and most of all your ability to communicate. So I’m going to challenge you to try and post more videos of yourself on social media that tell a story of who you are, teaching people valuable lessons, and giving people a call to action. You will be very satisfied with the results! Positive• Who do you surround yourself with daily personally & professionally? Teachable• Do you read self-motivating education daily? Present• Are you in the moment while doing your job or are you distracted by outside matters? Irreplaceable • Are you growing your craft daily and make yourself a precious commodity? Go to person• Are you open to helping individuals with their problems? Correctable • Are you fixing issues, or causing more of them? Flexible• Are you able to handle change without complaints? Coach-able• Are you open to constructive criticism? Accountable• Do you take ownership? Self Starter• Do you accomplish the job in a timely and profitable manner?